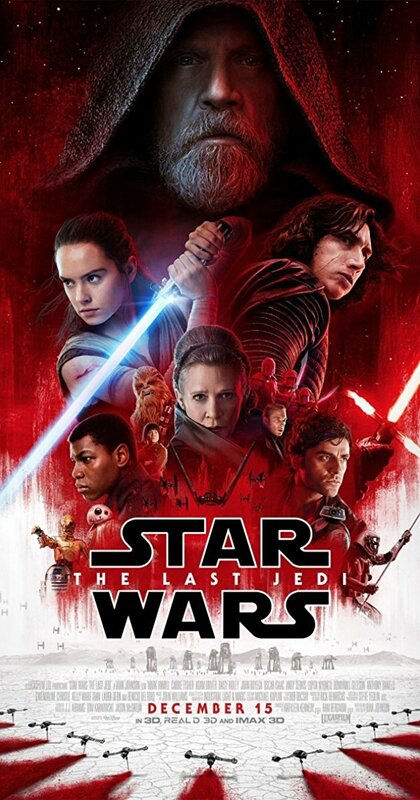 The novelization of the Last Jedi by Jason Fry, is published 8 March 2018. It contains many more plot details not seen in the film. A deleted scene featuring Captain Phasma has also been recently released. The last Jedi starts shortly after The Resistance’s new base is located by the First Order. Resistance fighters led by General Leia Organa evacuate their base when the First Order fleet arrives. Following an effective but costly counterattack led by Poe Dameron, Resistance fighters manage to destroy a First Order dreadnought, before the Resistance vessels jump into hyperspace to escape. However the First Order pursues them using a tracking device. Kylo Ren, Leia’s son, destroys the Resistance support fighters. Then the lead Resistance ship, is attacked killing several Resistance leaders and incapacitating Leia. So Command of the Resistance falls to Vice Admiral Holdo. However Poe, Finn, BB-8, and mechanic Rose Tico Disapprove of Holdo’s passive strategy, so they decide to take matters into their own hands and embark on a daring undercover mission. Meanwhile, Rey arrives on the remote planet of Ahch-To with Chewbacca and R2-D2 aboard the Millennium Falcon to recruit Luke Skywalker to the Resistance. However Luke is Disillusioned and embittered by the failures of the Jedi and is under self-imposed exile from the Force. Consequently Luke is reluctant and refuses to join the resistance, even after learning of Han Solo’s death. However Unknown to Luke, Rey and Kylo begin communicating through telepathic visions. Prompted by R2-D2, Luke agrees to teach Rey the ways of the Force. Luke and Kylo give Rey differing accounts of the incident that turned Kylo to the dark side; Luke confesses that he momentarily contemplated killing Kylo upon sensing that Supreme Leader Snoke had corrupted him, causing Kylo to destroy Luke’s emergent Jedi Order in retaliation. Nevertheless Rey is Convinced that Kylo can be redeemed, So she leaves Ahch-To to confront Kylo without Luke. Holdo meanwhile, reveals her plan to evacuate the remaining Resistance members using small transports. Poe disagrees and instigates a mutiny. Finn, Rose and BB-8 travel to the Canto Bight casino and with the help of a shady hacker named DJ, They infiltrate Snoke’s ship, however they Encounter Captain Phasma, although BB-8 escapes. Then Rey also lands on the ship, and Kylo brings her to Snoke, who reveals a dastardly plot, unfortunately though Snoke’s sinister machinations backfire spectacularly, then Kylo offers Rey a tempting Proposition however this does not go to plan. Meanwhile Leia orders the evacuation while Holdo remains on the ship to act as a decoy while the others flee to a nearby old Rebel Alliance base on Crait. Unfortunately DJ betrays the Resistance to the First Order, who attack the rebel alliance, so in desperation Holdo takes drastic measures against Snoke’s First Order fleet. Rey escapes in the chaos, while Kylo declares himself Supreme Leader. BB-8 frees Finn and Rose, who escape after defeating Captain Phasma, and join the survivors of the evacuation on Crait. When the First Order arrives, Poe, Finn, and Rose lead the fight back. Then Surprisingly Luke arrives to confront the First Order so the surviving Resistance fighters can escape. So The First Order forces attack Luke then Kylo himself engages Luke in an another thrilling showdown…. Meanwhile, Toad makes no effort to help, and orders himself a motor car instead.Mole wants to meet the respected but elusive Badger, who lives deep in the Wild Wood, but Rat -knowing that Badger does not appreciate visits – refuses to take him, telling Mole to be patient and wait and Badger will pay them a visit himself. Nevertheless, on a snowy winter’s day, whilst the seasonally somnolent Ratty dozes unaware, Mole impulsively goes to the Wild Wood to explore, hoping to meet Badger. He gets lost in the woods, sees many “evil faces” among the wood’s less-welcoming denizens, succumbs to fright and panic and hides, trying to stay warm, amongst the sheltering roots of a tree. Rat, upon awakening and finding Mole gone,guesses his mission from the direction of Mole’s tracks and, equipping himself with a pistol and a stout stick, goes in search, finding him as snow begins to fall in earnest. Attempting to find their way home, Rat and Mole quite literally stumble across Badger’s home — Mole barks his shin upon the boot scraper on Badger’s doorstep. Rat finds it and a doormat, knowing they are an obvious sign of hope, but Mole thinks Rat has gone crazy, only to believe him when the digging reveals a door. Badger – en route to bed in his dressing-gown and slippers -nonetheless warmly welcomes Rat and Mole to his large and cosy underground home and hastens to give them hot food and dry clothes. 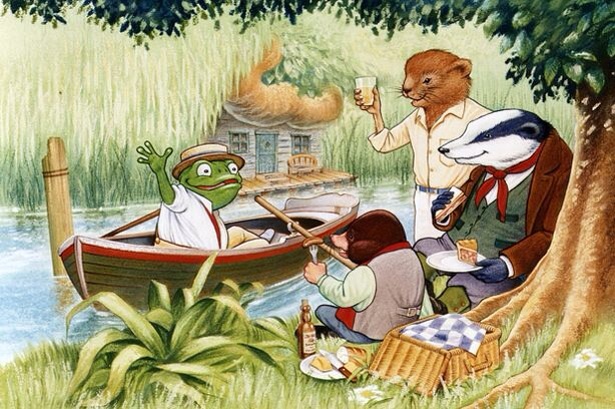 Badger learns from his visitors that Toad has crashed six cars, has been hospitalised three times, and has spent a fortune on fines. Though nothing can be done at the moment (it being winter), they resolve that once spring arrives they will make a plan to protect Toad from himself; they are, after all, his friends and are worried for his well-being.With the arrival of spring, Badger visits Mole and Rat to do something about Toad’s self-destructive obsession. The three of them go to visit Toad, and Badger tries to make him see sense eventually putting Toad under house arrest, with themselves as the guards, until Toad changes his mind. Feigning illness, Toad manages to escape, steals a car, which he drives recklessly and is caught by the police. and sent to prison for twenty-years. During Toad’s absence Badger and Mole continue to look after Toad Hall in the hope that Toad may return. Meanwhile in prison, Toad gains the sympathy of the Jailer’s Daughter who helps him to escape disguised as a washerwoman and he comes across a horse-drawn barge, whose Owner offers him a lift in exchange for Toad’s services as a “washer woman”. This does not go well and Toad finds himself tossed into the canal. However he manages to steal the barge horse, which he then sells to a gypsy, Toad flags down a passing car, which happens to be the very one which he stole earlier. The car owners, not recognizing Toad disguised as a washerwoman, permit him to drive their car. Once behind the wheel, he is repossessed by his former passion and drives furiously, declaring his true identity to the outraged passengers who try to seize him. This leads to an accident, after which Toad flees once more. Pursued by police, he runs accidentally into a river, which carries him by sheer chance to the house of the Water Rat. Toad now hears from Rat that Toad Hall has been taken over by weasels, stoats and ferrets from the Wild Wood, who have driven out its former custodians, Mole and Badger. So Badger formulates a plan to drive the unsuspecting weasels out while they are holding a party in honour of their leader, and reclaim Toad Hall.